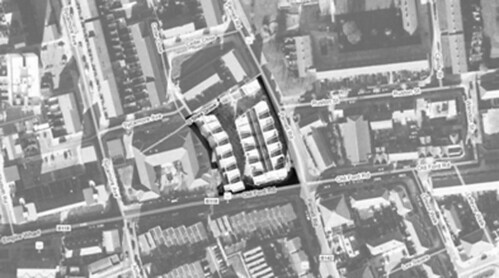 The Donnybrook site is located at the junction of Parnell and Old Fort Road. To the north of the site is newly developed private and social housing, on the sites which made up the former Monteith Estate. 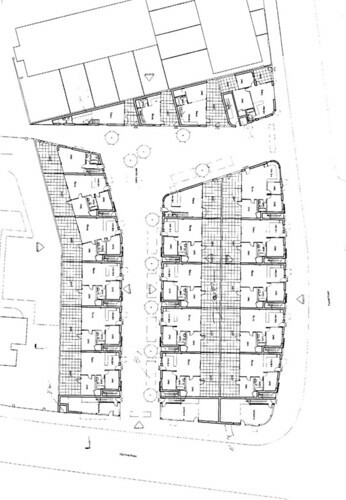 To the south of the site there is post war housing alongside fragments of the Victorian Grid. The social and heart of the area is the Roman Road, its market and the Victorian streets which flank it. Against a general background of social deprivation, the area around the site has seen a dramatic change of fortune in recent years with the provision of new community facilities and the replacement of decaying slab and tower residential blocks with new street based housing. The street at the heart of the scheme runs north/south and joins with an east/west connection between Parnell Road and the recently completed housing along the canal. It gives access to the dwellings on either side and offers a pedestrian route for people walking along Old Fort Road and into Parnell Road. At the junction between the two routes is a public square. The public square is open to new and existing residents of the area and the cross routes link the new development to the existing community. In all parts of the site buildings form a hard edge to the street. Bay windows and balconies ensure that every inch of public space is heavily overlooked (and self policed) by residents. The scheme is a zero parking scheme and residents were asked to sign a no-car agreement when applying to purchase/rent. 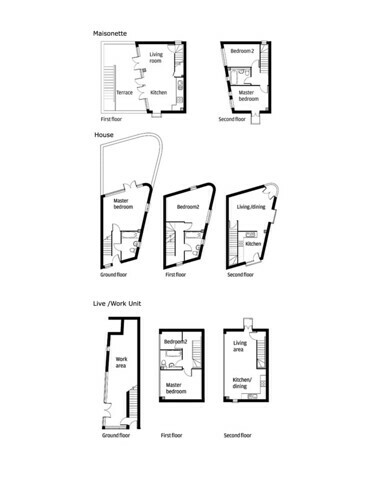 “designed to accommodate a vibrant mixture of occupants.” A series of ‘typical units’ accommodate small families or sharers, the two houses are family units and one bed flats and houses are suitable for single people. Live work units on Old Fort Road accommodate professionals wanting to work from home. There are eight affordable units (21%) for rent managed by Old Fort Housing. Two units (5%) were marketed as ‘shared ownership’. 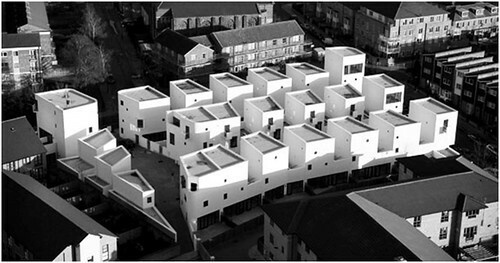 “we have developed a hybrid terrace/courtyard housing typology which has produced dwellings that are spacious, flooded with daylight and have a high level of privacy.” The terrace enables every dwelling to have its own front door with circulation between units concentrated in the public open space of the streets and not in stairwells and decks. The courtyard has made it possible to achieve high densities despite all dwellings being between one and four stories high. “the detailing of the buildings is as minimal as possible.” Materials were chosen for durability, to minimise maintenance, for ease and speed of construction and for environmental reasons. Facades have been finished with a white acrylic render system, which bounces light down into tight corners. Barber's standard building block is a two-bed ground floor flat with a two-bed maisonette sat on top. Each maisonette has its own gated entrance directly off the pavement. From here an external stair leads up to a private courtyard running from the front to back of the plan at first floor level. The majority of each maisonette's glazing is oriented towards this space, while French doors enable an easy relationship between the courtyard and the kitchen and living room sited on the lower of the dwelling's two levels. Deployed in sequence this configuration generates terraces of a distinctive serrated profile. The flank walls of the maisonettes register like a giant order, providing a visual structure for the pot-pourri of different openings that animate the elevations. In addition to the large windows, gates and doors that occupy the lower level of these frontages, bay windows and balconies are teased out over the pavement at high level.